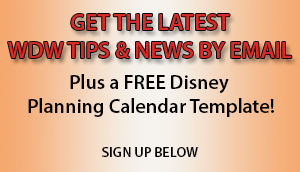 You are at:Home»Disney Resorts»I Have Mobility Challenges – Which Disney Resort Should I Pick? Choosing a Disney World resort can be a fun but daunting task. Every Disney resort is accessible, and you’ll be able to manage in any of them. However if you have mobility challenges, some resorts will be easier for you than others. Whether you’re planning on walking or using a wheelchair or ECV, there are still some things to consider. The Disney World Resort Size Can Be Important! Most of the Disney resorts are very large. In some of them you could get placed in a guest rooms that’s quite a hike from the resorts’ main activity areas. You can bypass this problem in some of the resorts by paying extra for a preferred room. These rooms are usually closer to the resorts’ main activity areas. If you don’t want to pay extra, or if the resort doesn’t have a preferred location, you’ll want to request a room that’s as close to the main activity areas as possible. Although Disney will try to accommodate you, they don’t make promises when it comes to room location. Even if you are guaranteed a handicapped room, keep in mind that these rooms are spread throughout the resorts, so there’s no guarantee that you’ll have a short walk to the resort’s activity areas or transportation. Here’s a list of the number of rooms in each resort to give you an idea of size. The Disney World Resort Design Can Make the Difference! In addition to resort size, the resort design is also important. Some resorts have their common areas so spread out, that you’ll have to walk (or ride) quite a bit or use resort transportation if it’s available, no matter where your room is. For example, at Coronado Springs the main pool is far from the main building where you’ll find the restaurants, store, etc. The main activity areas in the Caribbean Beach resort are far from the front desk and concierge, and Fort Wilderness is so huge and spread out that guests must use the internal bus system to get around. Most of the activity areas in Fort Wilderness don’t have parking, so you can’t drive to them. Disney rents golf carts to guests to use there, but if you’re in a wheelchair or ECV that won’t work. On the other hand, a resort like Port Orleans French Quarter is more compact and has the main activity areas close together. Wilderness Lodge is another resort that has the front desk, pool and dining areas fairly centralized. Another thing to consider is outside versus inside room access. If you’re in a wheelchair or ECV, you may want to spring for a resort that has everything connected and under one roof. For example, Wilderness Lodge has indoor lobbies, and you’ll find all dining under one roof. One benefit is that during bad weather you won’t have to take your wheelchair or ECV outside to get around. Here’s a page with links to the resort maps. You can examine them to see the size and design of each resort you’re interested in, where the common areas are, and which locations appeal to you. To help you with your choice of resort, we’ll be posting in-depth informational articles about each Disney World resort, as well as some non-Disney resorts. We’ll include observations that those with mobility challenges will be interested in, and we’ll include resort maps, information about the resort designs, pros and cons of each resort, and room location recommendations so you can make specific requests when you make your reservation. Tip: We have found that for those in wheelchairs and ECVs, Boardwalk Inn is challenging. While you will be able to get everywhere in the resort, the design of the resort and the number and placement of the elevators and automatic doors makes this resort more challenging and time-consuming to navigate. We’ve been there when there were broken elevators and automatic doors, and we had to walk really far to find another way. Hopefully they’re maintenance is better than what we experienced back then, but even if everything is in great working condition, compared to the other Disney resorts, we’ve found this one more challenging. If you have a wheelchair consider the resort room size. Value resort standard rooms are approximately 260 square feet. Moderate resort rooms are all around 314 square feet. Deluxe resort rooms vary in size, but start around 340 square feet. If you have the money, you can get a villa or suite with over 2,000 square feet! We have an ECV/scooter for my wife, but she does not need the alterations offered in the handicapped rooms, so we always get a standard room. We’ve found it very difficult to manage with an ECV in a value resort. It was difficult to get the ECV in a standard room because of the tight space. The design of the handicapped rooms make it easier, but it’s still tight. The moderate standard resort rooms are easier. We’re able to get the ECV in the room, park it and charge it. Deluxe resort rooms are the easiest, naturally. Where ever you decide to stay, I strongly suggest that anyone with a mobility issue rent a wheelchair or ECV if you don’t have one. This is true even if you don’t ordinarily need one. You’re at Disney to have fun, and you’ll be covering a LOT of ground. 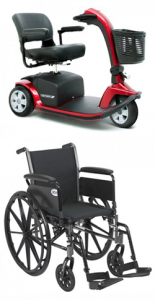 A wheelchair or ECV will keep you from becoming exhausted and your condition from becoming irritated. You’ll have a much better time. Most people find it well worth the money. 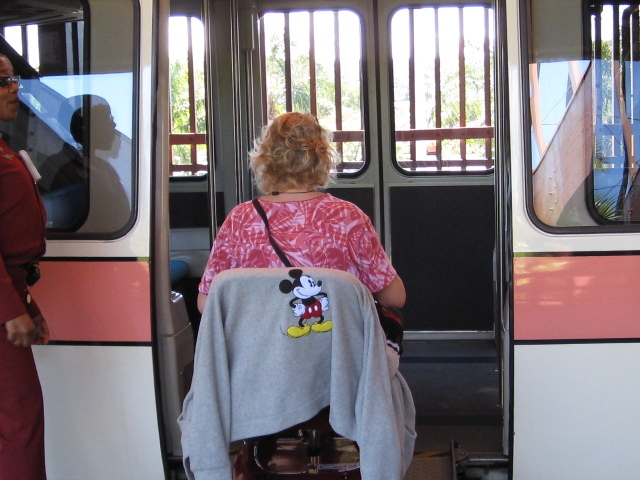 Disney only rents wheelchairs and ECVs in the parks and in Downtown Disney. I’d recommend renting from an outside (non-Disney) company, so you can have it for use at your resort. Outside companies tend to be less expensive than Disney anyway. I would choose a vendor from Disney’s Featured Provider list. These providers are permitted to drop off and pick up your equipment without your being there, which is much more convenient than having to be there for set appointments. You must be 18 to rent an ECV, although we hear that some outside companies may bend that rule for experienced ECV users. We have heard that Randy’s Mobility may be willing to do that. Read our article series called The Ultimate Guide to using Wheelchairs and ECVs at Disney World. If you’re unsure about the need to use a wheelchair or ECV, read our article called Should I use a Wheelchair or ECV/Scooter on my Disney World Trip? 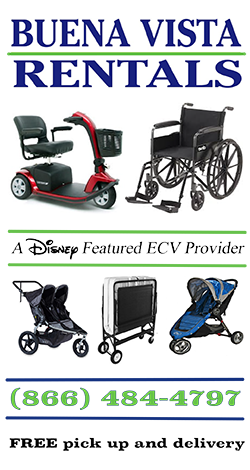 Have you found it easy or difficult to handle your ECV or wheelchair at Disney restaurants? Post your comments below!